My Aurora Forecast Pro is the best app for seeing the NorthernLights. Built with a sleek dark design, it appeals to both touristsand serious aurora watchers by telling you what you want to know -whether that is exactly how likely you are to see the auroraborealis or details about the solar winds and high-resolution sunimagery. With this app, you'll be seeing the Northern Lights in notime. - Find the current KP index and how likely you are to see theNorthern Lights. - View a list of the best locations to view fromright now. - Map showing how strong the aurora is around the world,based on the SWPC ovation auroral forecast. - Free pushnotifications when auroral activity is expected to be high. -Forecasts for the next hour, several hours and several weeks so youcan plan your Northern Lights viewing long in advance (subject toweather conditions). - Solar wind statistics and sun imagery. -Tour information so if you're considering to go to locations suchas Iceland or even Alaska or Canada, you'll be able to find toursthat we can recommend to you. If you want the latest updates ongeomagnetic activity and enjoy viewing the aurora borealis, thisapp is right for you. My Tide Times Pro is the only tide tables application you'll everneed. Whether you're surfing, fishing or just going to the beachyou'll be able to use it to get quick and easy access to the times.We think it's the most beautiful tide times application on themarket to date. FEATURES - Supports over 9,000 tidal stations inover 30 countries (including the US, Canada, Brazil, UK, Spain,France, Germany, Italy, Australia and New Zealand)! - Find thenearest locations to you when the app opens, so you can get tidetimes no matter where you are! - Never have to worry about ensuringthe data is up-to-date because the app takes care of that for you!- See 7-day forecasts for all locations (some even have 30-day tidecharts!) - View the moon phase, moonrise and moonset times! - Seecurrents information (the slacks, ebbs and flows for each day) atselected locations around the US & Canada! Just try to viewtide times as you normally would, if there's a currents stationnearby you'll see an extra tab for "Currents". - Basic wind speedinformation for all tidal locations! - When information has beendownloaded it is stored on the phone so you can view it without aninternet connection! - It offers a clean interface that you justwon't get from other apps! - No ads and includes widgets! If you'rein need of tide tables, charts, forecasts or times, don't goelsewhere - you can install My Tide Times Pro today. This is thead-free version of My Tide Times! My Earthquake Alerts Pro is a powerful earthquake information appwhich delivers all of the information you need, with pushnotifications included, all free of charge. It also includes abeautifully simple design optimized for the latest versions ofAndroid. FEATURES - Live earthquake information from all around theworld. - Free push alerts customized for you, with no restrictions.- Powerful search feature to find earthquakes dating back to 1970!- Beautiful & simple design, view earthquakes on a map and in alist. - Find the exact location, the depth and the distance awayfrom you. - No advertisements! If you need information ornotifications about the latest earthquakes near to you, download MyEarthquake Alerts Pro today. My Tide Times is the only tide tables application you'll ever need.Whether you're surfing, fishing or just going to the beach you'llbe able to use it to get quick and easy access to the tides. Wethink it's the most beautiful tide times application on the marketto date. FEATURES - Supports over 9,000 tidal stations in over 30countries (including the US, Canada, Brazil, UK, Spain, France,Germany, Italy, Australia and New Zealand)! - Find the nearestlocations to you when the app opens, so you can get tide times nomatter where you are! - Never have to worry about ensuring the datais up-to-date because the app takes care of that for you! - See7-day forecasts for all locations (some even have 30-day tidecharts!) - View the moon phase, moonrise and moonset times! - Seecurrents information (the slacks, ebbs and flows for each day) atselected locations around the US & Canada! Just try to viewtide times as you normally would, if there's a currents stationnearby you'll see an extra tab for "Currents". - Basic wind speedinformation for all tidal locations! - When information has beendownloaded it is stored on the phone so you can view it without aninternet connection! - It offers a clean interface that you justwon't get from other apps! If you're in need of tide tables,charts, forecasts or times, don't go elsewhere - you can install MyTide Times today. Guide for Animal Crossing NL is an app that will make playing thegame much easier. You'll be given access to information about thebugs, fish, events and community projects all at your fingertips.FEATURES - Find the fish and bugs that can be caught in each month- Discover which Animal Crossing animals you still need to becatch, by adding the ones you've caught to your "Catalog" - Learnabout the selling price and locations of the catchables - Receive anotification every time there's an Animal Crossing in-game event -all automatically! - Browse through a list of all of the communityprojects, allowing you to work out which to build next - View afull calendar of all of the upcoming events in Animal Crossing,including more details about each This app is truly essential toall Animal Crossing New Leaf players. It works offline too, so youhave access to a huge amount of information at all times. My Moon Phase Pro is the best app for tracking the lunar calendar.It has a sleek dark design which makes it easy to view informationsuch as the current moon cycle, moonrise & moonset times aswell as extras such as when the next full moon will be. If you'reinterested in moon photography, you can also find out when thegolden hours and blue hours are so you can take the most beautifulphotos. - View the moon cycle for any date in the future byscrolling on the date bar or by tapping the calendar button! -Either allow the app to use your current location or manuallyselect a location of your choice to use! - See how cloudy the skyis expected to be on upcoming days so you can work out whetheryou'll be able to see the moon or not! - Find the upcoming moonphases straight on the main screen - you'll instantly know when thenext full moon, new moon, first quarter and last quarter are. -Golden hour and blue hour times are available to allow you tocalculate when to take photos. - More specific information isavailable such as the moon's distance from Earth, the age of themoon as well as the current altitude. This is available for anydate on the lunar calendar. - Receive notifications when the moonreaches a particular phase of your choice. - No ads in this version+ no other in-app purchases. - Includes widget support. If you wantthe most efficient way of keeping up with the lunar calendar andthe current moon phases, then My Moon Phase Pro is the right appfor you. My Moon Phase is the best app for tracking the lunar calendar. Ithas a sleek dark design which makes it easy to view informationsuch as the current moon cycle, moonrise & moonset times aswell as extras such as when the next full moon will be. If you'reinterested in moon photography, you can also find out when thegolden hours and blue hours are so you can take the most beautifulphotos. - View the moon cycle for any date in the future byscrolling on the date bar or by tapping the calendar button! -Either allow the app to use your current location or manuallyselect a location of your choice to use! - See how cloudy the skyis expected to be on upcoming days so you can work out whetheryou'll be able to see the moon or not! - Find the upcoming moonphases straight on the main screen - you'll instantly know when thenext full moon, new moon, first quarter and last quarter are. -Golden hour and blue hour times are available to allow you tocalculate when to take photos. - More specific information isavailable such as the moon's distance from Earth, the age of themoon as well as the current altitude. This is available for anydate on the lunar calendar. - Receive notifications when the moonreaches a particular phase of your choice. - Completely free ofcharge for all functionality, no in-app purchases. If you want themost efficient way of keeping up with the lunar calendar and thecurrent moon phases, then My Moon Phase is the right app for you. Aurora Alert is an app designed to alert you when you have the bestchance of seeing the aurora borealis in your area (aurora australisin the southern hemisphere.). It is designed to work "right out ofthe box", without any configuration needed from the user. 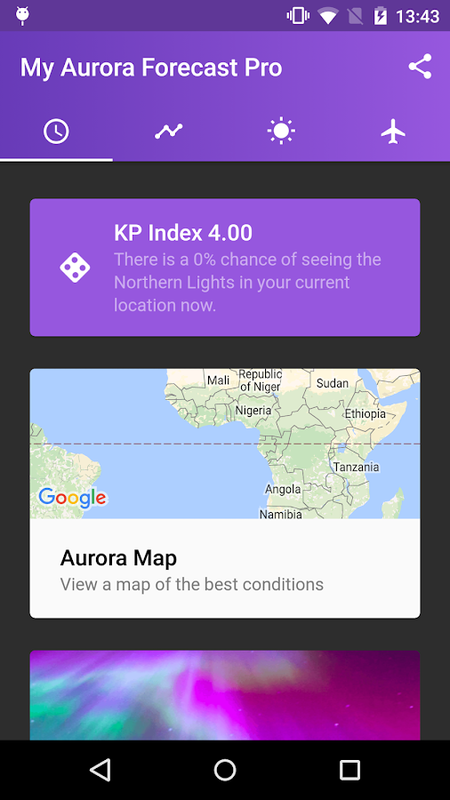 Thisdesign makes Aurora Alert an ideal app for all users. Novice usersbenefit from the automated nature of the app, while intermediate toadvanced users can enjoy an abundance of data at theirfingertips.Features:- Automatically alerts when auroral activity ishigh enough- Current auroral activity based on Kp and historygraphs- Auroral oval map customized for all locations- NOAA Kppredictions within the next few hours- 3-day aurora forecast- Solarwind and IMF data- Configure when you can be alerted based on skydarkness- Filter out alerts based on current cloud cover- Severallocal K-indices available for the most up-to-date activity- Moonphase calendar includedWhen first launching Aurora Alert, it willfind your location from GPS or cell networks, and then configureyour settings based on the results. Users can then adjust anysettings, if they wish. Aurora Alert will then update in thebackground, as often as you wish, and will alert you to possibleaurora sightings when the conditions are favorable. You’ll nevermiss a chance to see the northern lights again!Aurora Alert isconfigured to run as efficiently as possible. Automatic updateswill download only 5KB of compressed data per update, which sparesusers of downloading needless data against their limits. It alsoruns only when it needs to, and no more, which helps save batterylife and frees up for RAM for other apps. Note that since AuroraAlert needs to update in the background, certain task killer appscan prevent it from updating. So if you run any task killers,Aurora Alert will need to be on the ignore list in order to keepupdating.For more screenshots, see the website link below. Yourfeedback would be appreciated. My Aurora Forecast is the best app for seeing the Northern Lights.Built with a sleek dark design, it appeals to both tourists andserious aurora watchers by telling you what you want to know -whether that is exactly how likely you are to see the auroraborealis or details about the solar winds and high-resolution sunimagery. With this app, you'll be seeing the Northern Lights in notime. - Find the current KP index and how likely you are to see theNorthern Lights. - View a list of the best locations to view fromright now. - Map showing how strong the aurora is around the world,based on the SWPC ovation auroral forecast. - Free pushnotifications when auroral activity is expected to be high. -Forecasts for the next hour, several hours and several weeks so youcan plan your Northern Lights viewing long in advance (subject toweather conditions). - Solar wind statistics and sun imagery. -Tour information so if you're considering to go to locations suchas Iceland or even Alaska or Canada, you'll be able to find toursthat we can recommend to you. - Completely free of charge for allfunctionality, no in-app purchases. If you want the latest updateson geomagnetic activity and enjoy viewing the aurora borealis, thisapp is right for you. This version is ad-supported. The Aurora Forecast 3D is a tool to track down where the aurora islocated in the sky from any location on planet. It renders Earth in3D with rotation and scaling at your fingertips. You can selectlocations and make your own ground - station list. The Sunilluminates the globe as it updates in near real-time (1 secondepochs). The short term forecasts are up to +6 hours, while longterm forecasts are up to 3 days ahead in time. They are updatedwhen the app is active and connected to internet. An Aurora Compassis included that shows where the auroral oval, the Moon and the Sunare located as you look up at the sky from your location. The phaseand age of the Moon is also visualized in the compass. By zoomingout in the 3D view port, satellites, stars and planets appear intheir orbits around the Sun. IMPORTANT NOTE FOR UPGRADES Theupgrade will clear old cache and data used. FEATURES - 3D view portof Earth with zoom and rotation enabled. - Solar illumination ofthe Earth and the Moon. - Aurora oval size and location in realtime [1,2]. - Location of the Day-side Cusp aurora (red) -Forecasts based on predicted Kp index +0, +3 and +6 hours ahead intime estimated by the Space Weather Prediction Centre (NOAA-SWPC).- Color scaled Kp speedometer. - Aurora Compass sky view display. -Editable station / location list - Go to animation. - RightAscension (RA) and Declination (DEC) of the Moon, Sun and 8planets: Mercury, Venus, Mars, Jupiter, Saturn, Uranus, Neptune andPluto  - Age of the Moon including the phase. - Includes a 2.4million star map . - City light texture . - Earth, Sun andMoon textures [6,7]. - Sky view module to track planets and stars. - Geomagnetic storm alert messages. - 3-day space weathercondition forecast as news ticker. - 3-day long term Kp indexsummary plot. - Two-Line Element (TLE) satellite orbit calculations. - Apparent Solar Time (AST) as analog clock in Sky viewmodule. - Skyview navigation. References  Sigernes F., M.Dyrland, P. Brekke, S. Chernouss, D.A. Lorentzen, K. Oksavik, andC.S. Deehr, Two methods to forecast auroral displays, Journal ofSpace Weather and Space Climate (SWSC), Vol. 1, No. 1, A03,DOI:10.1051/swsc/2011003, 2011. Starkov G. V., Mathematicalmodel of the auroral boundaries, Geomagnetism and Aeronomy, 34 (3),331-336, 1994. P. Schlyter, How to compute planetary positions,http://stjarnhimlen.se/, Stockholm, Sweden. Bridgman, T. andWright, E., The Tycho Catalog Sky map- Version 2.0, NASA/GoddardSpace Flight Center Scientific Visualization Studio,http://svs.gsfc.nasa.gov/3572, January 26, 2009. The VisibleEarth catalog, http://visibleearth.nasa.gov/, NASA/Goddard SpaceFlight Center, April-October, 2012. T. Patterson, Natural EarthIII - Texture Maps, http://www.shadedrelief.com, October 1, 2016. Nexus - Planet Textures,http://www.solarsystemscope.com/nexus/, January 4, 2013. Hoffleit, D. and Warren, Jr., W.H., The Bright Star Catalog, 5thRevised Edition (Preliminary Version), Astronomical Data Center,NSSDC/ADC, 1991. Vallado, David A., Paul Crawford, RichardHujsak, and T.S. Kelso, Revisiting Spacetrack Report #3,AIAA/AAS-2006-6753, https://celestrak.com, 2006. Are you tired to look in dozens of websites? Or to always call youNorthern Lights forecast expert friend? Then this app is your newexpert friend! Northern Eye App helps you keep track of NorthernLights (aka Aurora Borealis) activity daily and hourly. It caninform you about: - the probability of viewing the northern lightsin your location at any given time; - the weather and visibilityconditions in your location; - long and short term forecast ofNorthern Lights activity - Useful indicators about sun's activity.Northern Eye App is also a custom notifier: it can also send youalerts if the chances of witnessing such wonderful lights show arehigher than a threshold. What are you waiting for? Don't miss outon things you love the most. Stay warm outside, and don't forgetbring with you a hot chocolate mug! Northern Eye Aurora Forecast,your bridge to awareness. Your trusted friend in Northern Lights(Aurora Borealis) forecast. Don't miss out on the stunning show ofNorthern Lights, right outside your walls. This app uses Google Cloud Messaging to inform you when it may bepossible to see the Northern Lights (Aurora Borealis).If you arenotified too often, increase the threshold value in the settingstab! Welcome to the ad-free version of Northern Eye Aurora Forecast!Besides a forever ad-free version of the app, with this Pro versionyou will also have the advantage of a DEDICATED web server,different from the free version. This means that chances of theserver being overloaded and not responding/failing are way lower!Are you tired to look in dozens of websites? or to always call younorthern-lights-forecast trusted friend? Then this App is your newtrusted friend! Northern Eye App helps you keep track of northernlights' (Aurora Borealis) activity daily and hourly. Northern EyeApp is also a custom notifier: it can also send you alerts if thechances of witnessing such wonderful lightshow are higher than athreshold. What are you waiting for? Don't miss out on things youlove the most. Stay warm outside, and don't forget bring with you ahot chocolate mug! Northern Eye Aurora Forecast, your bridge toawareness. Your trusted friend in Aurora Borealis' forecast. Don'tmiss out on the stunning show of Northern Lights, right outsideyour walls.